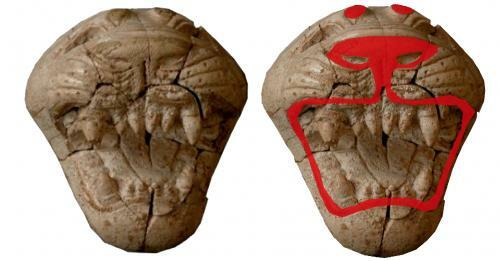 Ancient Phoenician ivory carvings like this lion head that look colorless today (left) actually were adorned with brilliant colors 2,800 years ago (right), scientists are reporting. The fabled ivory carvings from the ancient Phoenician city of Arslan Tash—literally meaning "Stone Lion"—may appear a dull monochrome in museums today, but they glittered with brilliant blue, red, gold and other colors 2,800 years ago, a new study has confirmed after decades of speculation. It appears in the ACS journal Analytical Chemistry. Ina Reiche and colleagues explain that these carvings are rare, housed in museums like the Louvre, and art experts regard them as the most beautiful ivory carvings of the era. Experts long believed that the lion heads, amulets and other objects were brightly colored, rather than the bland beiges and whites that remain today. But until recently, there was no adequate way to test the ivories for traces of pigment without damaging these priceless objects. The scientists describe how a non-destructive testing technology brought to life traces of red, blue and other pigments—and gold gilding—allowing re-creation of the long-vanished colors that decorated the original ivories. In addition to contributing to a new understanding of the Phoenician carvings, the technology could be used to glimpse the original paintings on other objects, the authors note. Those include the Elgin Marbles, the classical Greek marble sculptures that originally were part of the Parthenon and other buildings on the Acropolis in Athens. The article is titled "Discovering Vanished Paints and Naturally Formed Gold Nanoparticles on 2800 Years Old Phoenician Ivories Using SR-FF-microXRF with the Color X-Ray Camera." Phoenician ivory objects (8th c. BC, Syria) from the collections of the Badisches Landesmuseum, Karlsruhe, Germany, have been studied with full field X-ray fluorescence microimaging using synchrotron radiation (SR-FF-microXRF). The innovative Color X-ray Camera (CXC), a full-field detection device (SLcam®), was used at the X-ray fluorescence beamline of the ANKA synchrotron facility (ANKA-FLUO, KIT, Karlsruhe, Germany) to non-invasively study trace metal distributions at the surface of the archaeological ivory objects. The outstanding strength of the imaging technique with the CXC is the capability to record the full XRF spectrum with a spatial resolution of 48 μm on a zone of a size of (11.9 x 12.3) mm2 (264 x 264 pixels). For each analyzed region, 69 696 spectra were simultaneously recorded. The principal elements detected are P, Ca and Sr coming from the ivory material itself, Cu characteristic of pigments, Fe and Pb representing sediments or pigments, Mn revealing deposited soil minerals, Ti indicating restoration processes or correlated with Fe sediment traces and Au, linked to a former gilding. This provides essential information for the assessment of the original appearance of the ivory carvings. The determined elemental maps specific of possible pigments are superimposed on one another to visualize their respective distributions and reconstruct the original polychromy and gilding. Reliable hypotheses for the reconstruction of the original polychromy of the carved ivories are postulated on this basis.